The PC-12 is great for the whole house up to 12 gallons per minute. Quality UV Lamps Manufactured in the U.S. are rated for 9000 hours and made from solid stainless steel. Sterilizers feature a built-in alarm. If the UV lamp fails, the alarm will sound. Great quality at lowest prices! For water pressure up to 100 PSI. A. GPM stands for Gallons Per Minute. This refers to the rate at which water is flowing through a pipe. UV sterilizers are rated for the maximum flow rate they can safely process water and still kill bacteria. So for example 6 GPM means in one minute, 6 gallons can flow through the UV. Q. How can I know what size I need? A. For homes select the 12 gallon-per-minute ("GPM") PC12 or NSF certified 13 GPM GN15 models. For under the sink or point of use, select the PC2 2 GPM model. Most customers use the GN15 or PC12 fine for homes with 1 - 3 bathrooms. Q. What is NSF certification? A. NSF stands for the National Sanitation Foundation which is a highly regarded independent certification organization. NSF certification means that product has passed stringent testing and the manufacturers claims are verified. Q. What is the difference between the PC series and GN series? A. The PC series is a good quality, lower cost UV sterilizer. The lamps and sleeves are manufactured by an European company. The GN model is NSF certified and the lamps are made in the U.S. and are slightly higher quality than the PC series. Both do a good job however, as long as the water is clear and meets minimum standards for UV treatment. The GN series also comes with a flow control that fixes the flow so it cannot exceed 12 GPM. Q. Are there any special requirements or conditions my water must have, before I can consider using Ultraviolet Sterilizer to disinfect my water? A. Water to be treated by UV light should be clear and low in hardness minerals, which is less than 7 grains per gallon (120 PPM). Water should be free of color. Iron should be less than 0.3 mg/L. Manganese should be less than 0.05 mg/L. The pH range should be 6.5 to 9.5. Q. Where would I install a UV light sterilizer? A. Ultraviolet sterilizers are installed typically right before the water enters the home. 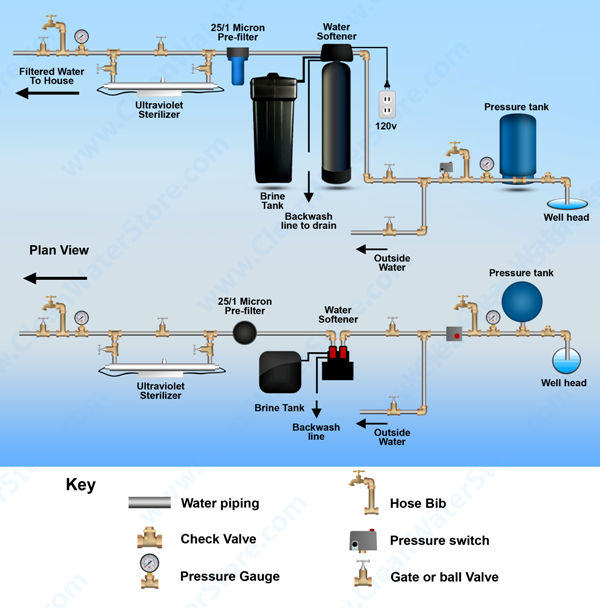 If you have an existing water softener, it is installed after the softener. Often a 5 micron prefilter is used prior to the UV sterilizer. If iron or manganese is present, install after an iron filter system. We often recommend a whole house filter using a dual grade 25 to 1 micron filter cartridge prior to UV sterilizers.